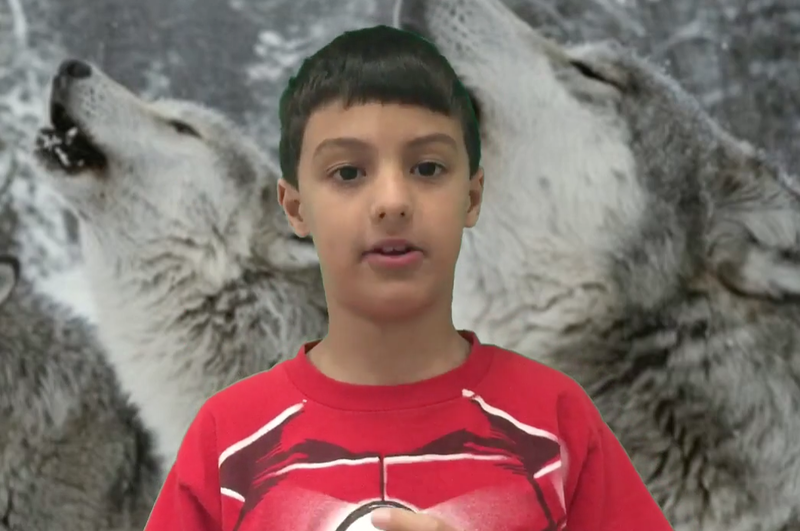 Kids (and teachers) learn to make green screen presentations in Global Explorers. Teaching new STEM skills to students can be a daunting experience, but it doesn’t have to be. Being successful in the classroom often involves having the right resources and knowing how to deliver them. When I taught Global Explorers at Princeton Junior School during the school’s STEAM immersion week this spring, I came equipped with Level Up Village’s fully developed curriculum to guide me through the lessons. Here are my top three take-aways from teaching this course and how it can enhance your science classroom this upcoming school year. Learn about indigenous Animals – Let’s face it. Kids love animals. Log into any social media application and you’ll see some video, image, or gif of an adorable animal eating or playing. Why not harness this interest to enhance your students’ classroom experience? By offering Global Explorers in your school, students will learn about the many animals in the world and why they thrive in their natural habitats. They will be introduced to a plethora of species and adaptations that have allowed them to survive and reproduce in the seven biomes of the world. Moreover, they will develop a knowledge base about an individual animal of their choosing – one that is native to your community. 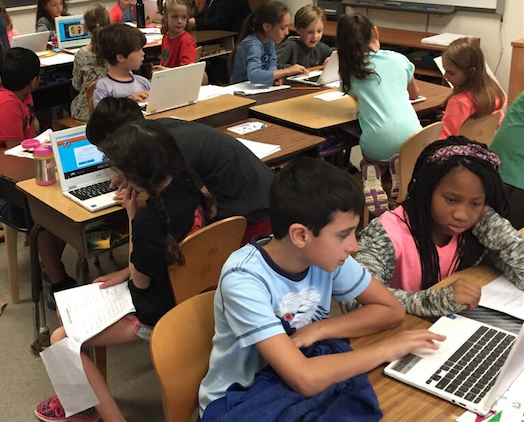 Students at Princeton Junior School research facts about the indigenous animals they studied in their Global Explorers course during STEAM Immersion week this spring. Students build a relationship with Global Partners – Not only will your students study a species that is indigenous to your own community, they will also learn about animals that are native to their global partner’s country. This key aspect of Level Up Village classes – building a relationship with a partner student in a developing country – helps increase the chances that your students will remember what they learn since they will have an additional connection to the material. Imagine a classroom filled with resources about jaguars, an animal native to Nicaragua, while your students try to retain the information they’re reading. Now imagine your students learning all about jaguars directly from their new friends in Nicaragua, including the tale of a close encounter. Which scenario do you think will create more lasting memories? Part of every Level Up Village course is a series of video exchanges with partner students. 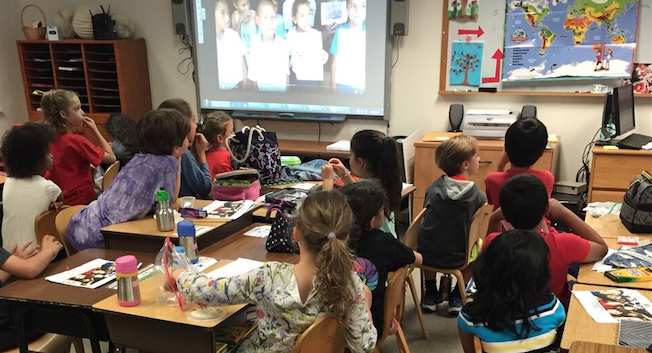 Here students at Princeton Junior School watch a video from their partners at NicaPhoto in Nicaragua. Survival of the fittest: Teacher Edition – Have you ever tried out a new app and became frustrated that you cannot maneuver around it easily? Or have you been wondering how to bring new technology into your classroom to get ahead of the curve and keep up with your tech-savvy fellow teachers? By bringing Global Explorers to your classroom, your students will marvel at your new green screen skills. The best part is, it’s so simple! By using a variety of user-friendly tools, you will be able to quickly create quality green screen videos that combine both videos from your students with those made by their partners. Trust me when I say any and all time spent out of class preparing to teach Global Explorers will be rewarding. The excitement on your students’ faces when they see the completed video is worth it. 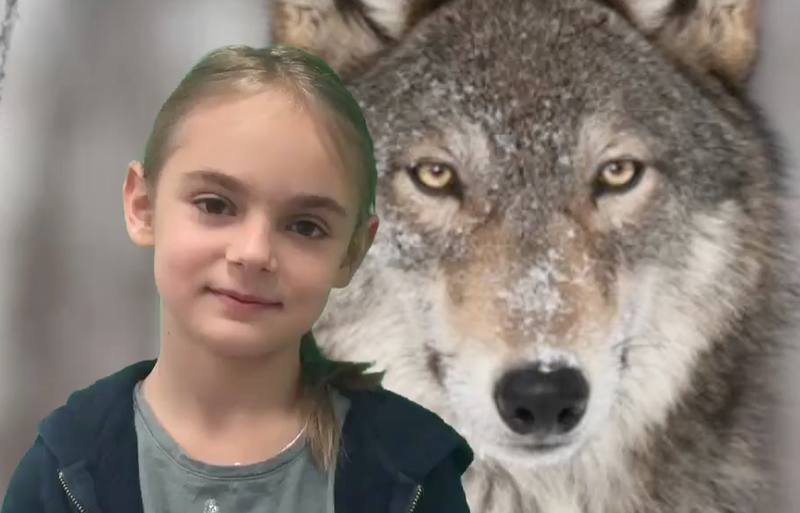 Students learn to create dramatic backgrounds using photos of the animal they’re studying in their green screen presentation. Teaching can be challenging, so why not let Level Up Village tackle half the battle for you by handing you a polished core-meeting curriculum? LUV courses also give teachers the opportunity to receive professional development in a variety of STEAM skills including green screen presentations, coding, web design, CAD and 3D printing. By working with LUV, your school can give back at the same time. A portion of the Level Up Village tuition is used to donate the same course and supplies to one of our Global Partner organizations in the developing world. It was a very special experience teaching the Princeton Junior School students alongside my partner teacher Karen and her students at NicaPhoto in Nicaragua. The wealth of knowledge my students acquired about animals and adaptations – from a global perspective – was truly inspiring. Enjoying a laugh during Global Explorers at NicaPhoto in Nicaragua. These students were the global partners for the kids at Princeton Junior School. Nicole Brill: Nicki Brill has taught nearly every Level Up Village course and also is the Account Director for LUV.